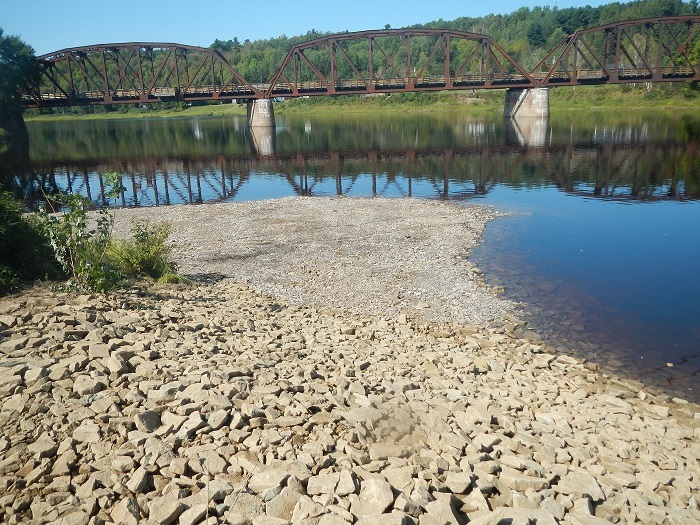 The project site is located along a section of the SW Miramichi River in the Village of Doaktown, NB, immediately upstream of the bridge crossing on Route 8. Doak Brook enters the SW Miramichi River on the right bank (south bank) and flows into relatively deep water. Widening of the mouth of the brook had resulted in reduced energy flow at the mouth which inhibited the brook’s cold water from entering far enough out into the river where salmon prefer to hold in deeper water during the summer’s flow of low warm water. To increase the brook’s energy, the mouth of the brook was narrowed by installing a rock toe along the right bank as it merges with the riverbank. 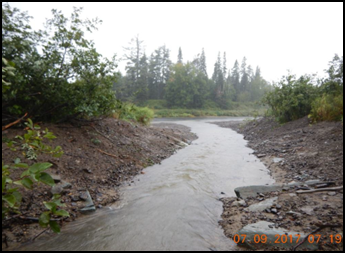 In addition, a nature-like point bar feature was installed on the downriver side of the confluence (right bank of the brook) which will direct cold water into the deep area of the river where salmon typically hold during periods of low warm water. An embedded rock toe was also installed to help the brook transition into the river. This habitat enhancement work was initiated and completed on Sept. 14, 2015. A further enhancement followed on September 26, 2015 with the installation of a large cement pad boat ramp. 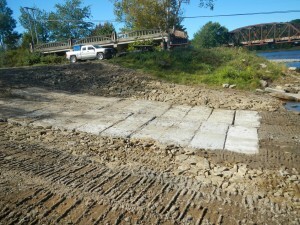 This ramp will prevent tire-spinning and erosion when launching or retrieving boats in the boat launch area, which is located within the cold water plume of Doak Brook. 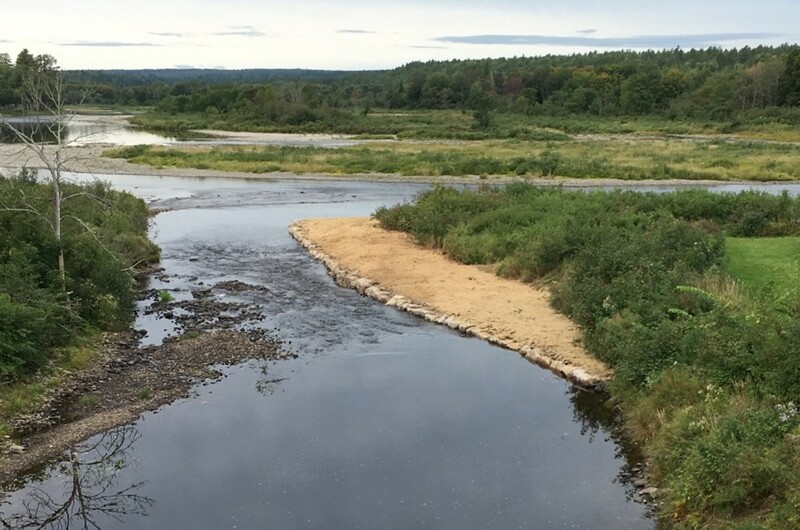 Funding support for this project was received from the Recreational Fisheries Conservation Partnership Program (RFCPP), the New Brunswick Wildlife Trust Fund (NBWTF) and the Atlantic Salmon Conservation Foundation (ASCF). The MSA’s financial contribution was provided through MSA Campaign 60 revenues. 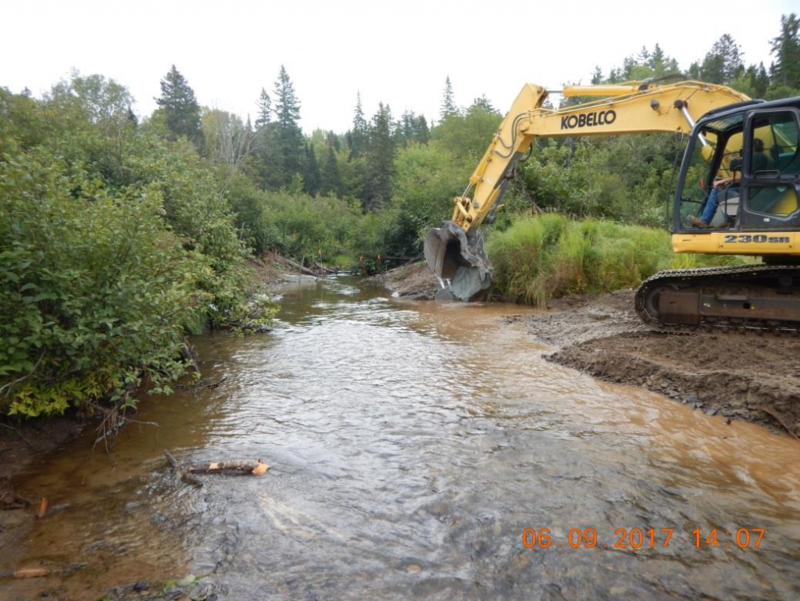 The project site is located at the confluence of Otter Brook and the LSW Miramichi River, approximately 6.5km downstream of Catamaran Brook. The brook enters the river on the right (south) bank. 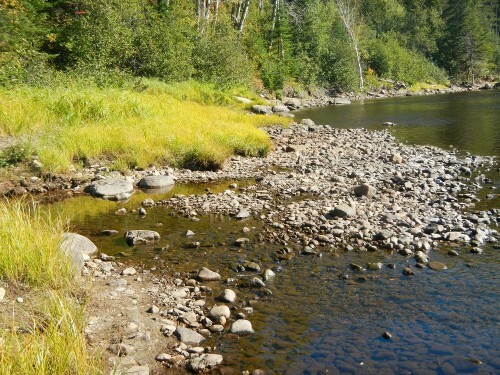 The LSW Miramichi is very shallow in this area during typical summer low flows, and the cold water plume created by the brook is known to provide thermal refuge for mostly young juvenile salmon. Enhancing the brook’s plume will transform the area into a more favourable physical thermal refuge for adult Atlantic salmon as well. 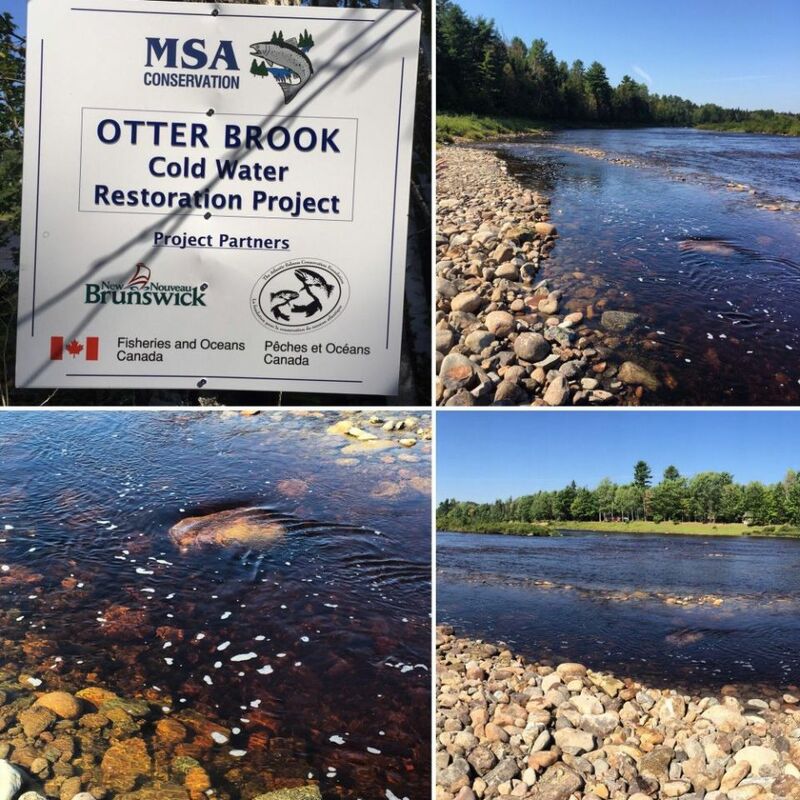 To enhance the refuge’s thermal features, the water depth was increased at the mouth of Otter Brook through the installation of a rock v-weir upstream in the LSW Miramichi River to concentrate flow and encourage scouring at the mouth of Otter Brook. The v-weir was set at an elevation so as to create scour and direct flow from the shallow river into a concentrated area where cold water meets the river. Rock spurs were also installed in conjunction with the v-weir downriver of the confluence to keep the cold water plume turned away from the shallow riverbank and also to help scour and maintain deeper water in the refuge zone. 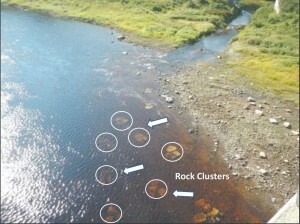 Finally, a row of embedded boulders were placed near the outer edge of the cold water plume so that in summer low flows, cold water from the brook is able to concentrate in the scoured region without significant mixing with warm river water. This habitat enhancement work was initiated on Sept. 15, 2015 and completed on Sept. 16, 2015. 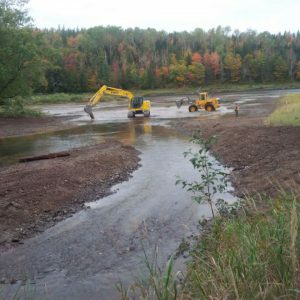 Funding support for this project was received from the Recreational Fisheries Conservation Partnership Program (RFCPP) and the Atlantic Salmon Conservation Foundation (ASCF). The MSA’s financial contribution was provided through MSA Campaign 60 revenues. 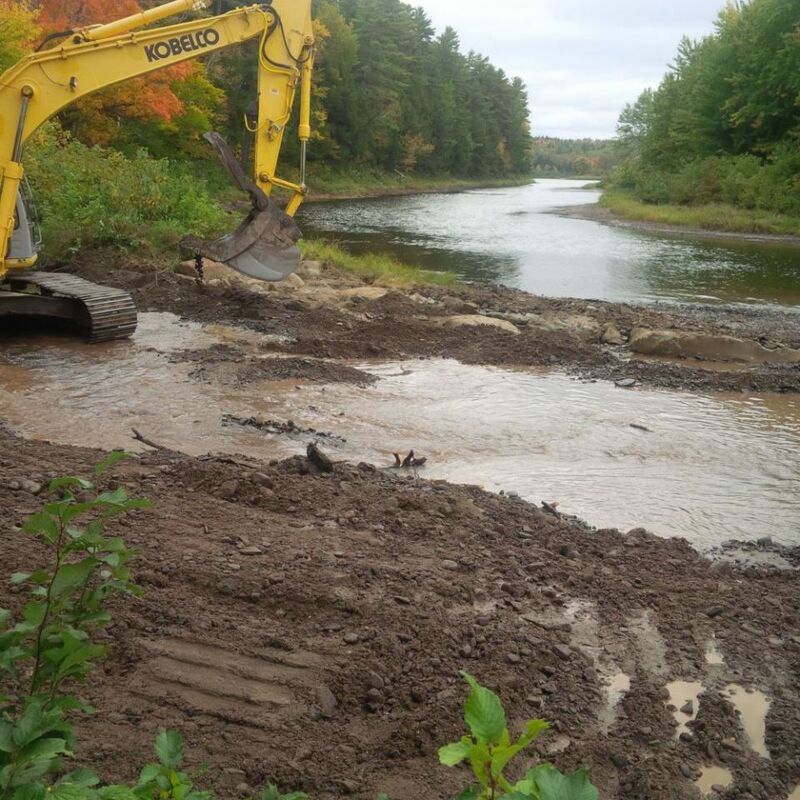 This project site is located at the confluence of Indiantown Brook and the SW Miramichi River in Quarryville, an area located in the lower stretch of the river system. The brook enters the river on the left (north) bank and enters the Miramichi River in a relatively deep area, creating a cold water refuge known to be used by adult Atlantic salmon during warm water periods in the summer. This site is easily accessible, rendering it easily susceptible to predation and poaching while salmon are confined to the cold water pool at the mouth of the brook. To enhance the refuge’s habitat features, boulder clusters were installed directly into the existing pool. Placement of these boulder clusters will cause flow separation around the rocks, resulting in the formation of eddies in their wake. Eddies diffuse the sunlight, providing overhead cover for fish. In addition, flow vertices generate scour that form pockets of deeper water and promote settling of coarser substrate which improves physical substrate diversity. Such features provide ideal conditions for juvenile and adult salmonids. Diversifying substrate with boulder clusters will also discourage poaching efforts, as fish will no longer be easily spotted and nets will no longer easily swept through the pool. This habitat enhancement work was initiated on Sept. 16, 2015 and completed on Sept. 17, 2015. Funding support for this project was received from the Recreational Fisheries Conservation Partnership Program (RFCPP) and the Atlantic Salmon Conservation Foundation (ASCF). The MSA’s financial contribution was provided through MSA Campaign 60 revenues. 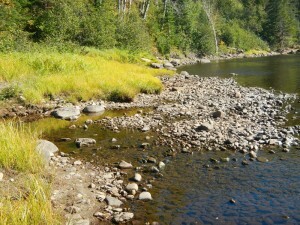 Pats Brook flows into the NW Miramichi River approximately 6.8km north of the Trout Brook confluence. The brook enters the river on the left (north) bank. The river is shallow in this area during typical summer low flows and the plume created by the cold brook water provides thermal refuge to primarily juvenile salmon. 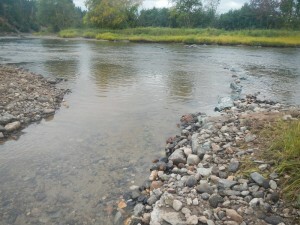 To enhance this habitat as an adult salmon refuge, a rock V-weir was installed upriver of the confluence of the brook and river, set at an elevation that will create scour at the mouth of the brook. This will direct flow from the shallow river into a concentrated area where cold water meets the river. Channel material was removed downstream of the v-weir to encourage flow direction and create greater depth immediately in the refuge. Rock spurs installed in conjunction with the v-weir downriver of the confluence will help keep the cold water plume turned away from the shallow riverbank and directed toward the deeper pool. This habitat enhancement work was initiated and completed on Sept. 28, 2015. 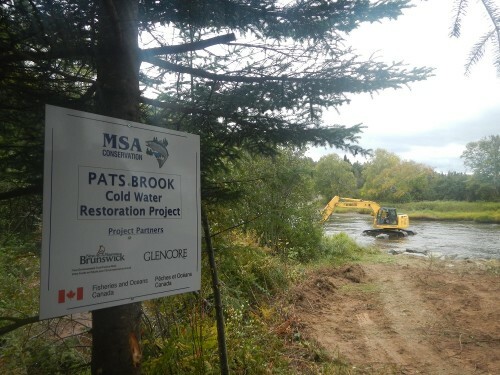 Funding support for this project was received from the Recreational Fisheries Conservation Partnership Program (RFCPP), the New Brunswick Environmental Trust Fund (NBETF) and Glencore Canada. The MSA’s financial contribution was provided through MSA Campaign 60 revenues. 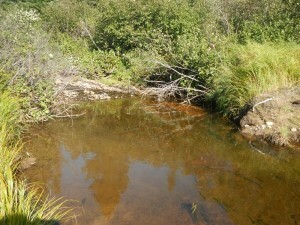 Donnelly Brook is a tributary of the SW Miramichi, located a short distance above the Upper Blackville Bridge. The goal of this restoration project was to improve the river system’s ability to transfer concentrated cold water from Donnelly Brook out into the SW Miramichi and downriver to the existing salmon pool, thus improving the pool as a cold-water refuge for Atlantic salmon. This was accomplished by narrowing the bankfull width at the mouth of the brook to approximately 10 m (an appropriate width for this size of brook) and redirecting the flow into the thalweg of the SW side channel. Large rock (1.0m diameter) was used to narrow the channel. Stream sedimentation at the mouth of Donnelly Brook was also a concern. Therefore, another objective of the project design was to create conditions that would discourage material deposition at the confluence of the brook and the SW side channel. By re-establishing the SW side channel thalweg on the outside bend, where it meets Donnelly Brook, provided increased flow energy on the outside bend and helps transport material away from the confluence. Re-alignment of the thalweg was achieved by removing a gravel bar that was at the mouth of the brook and installing 3 rock spurs along the outer bend on the right bank. Parks Brook is a natural cold-water stream that empties into the Little Southwest Miramichi River near Halcomb, NB. Sedimentation caused by stream bank destabilization and erosion was threatening the cold-water thermal refuge/sanctuary located where brook empties into the River. Therefore the project's design was to promote flow conveyance and bank stabilization near the mouth of Parks Brook. 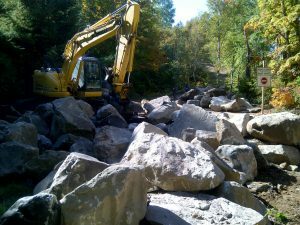 This was accomplished by installing rock toes by fully embedding 1.0 meter diameter rocks within the brook’s stream bed. These started at an off-road berm, tying into a modified riffle upstream, and extended approx. 22 meters on the right bank and 25 meters on the left bank down to the LSW Miramichi. A second line of 1.0 meter diameter rocks were placed behind the first row at the eroding road berm on both banks, creating a double line of rocks at the road berm to form a bank slope of 2H:1V. A modified riffle was also installed at the upstream ATV ford crossing to further reduce erosion. This project was completed on August 18, 2016. 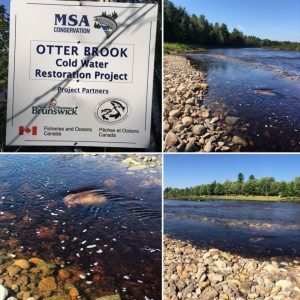 On September 6-7, 2017, the MSA completed its 7th cold-water refuge enhancement project, located at the confluence of Salmon Brook and the Cains River (a major tributary of the SW Miramichi). This project removed excessive sediment deposition, restored the brooks channel to enhance the concentration and flow of cold brook water out into the main stem of the river and installed rock weirs/deflectors to discourage future sedimentation, thereby improving the confluence of the brook as a cold-water refuge for Atlantic salmon, native trout, and other aquatic species. 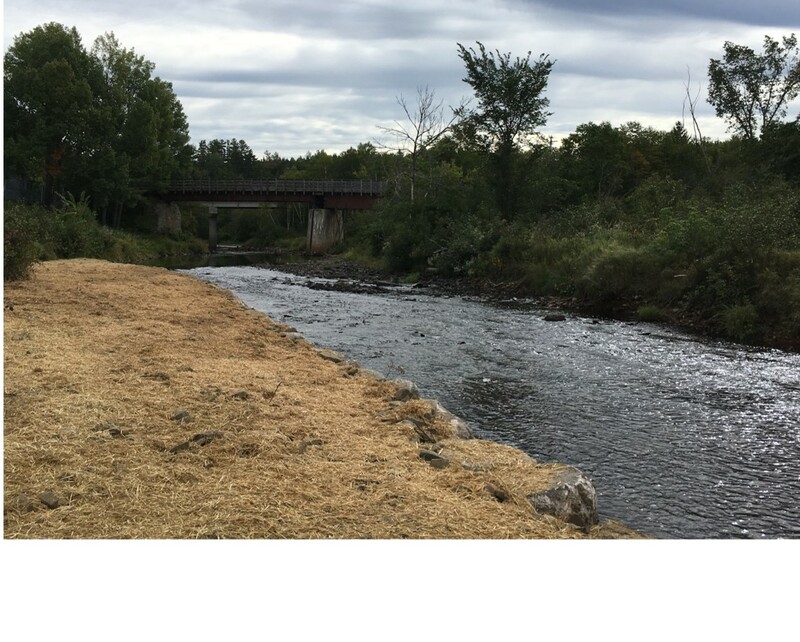 In mid-September, the MSA completed a major cold-water enhancement project at the confluence of Burnt Land Brook and the SW Miramichi, located in Boiestown, NB. This project was undertaken because the channel bed of the brook was aggrading as sediments were being deposited in the channel and not flushed through to the main river. As the channel bed increased in height, the resulting affect was additional scour on the banks leading to an over-widening of the channel bankfull width. 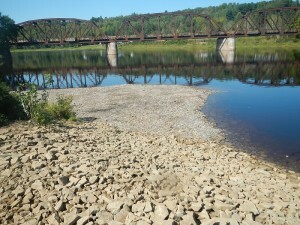 The situation had been going on for years, causing part of the flow along the south bank of the SW Miramichi River to be directed into the right bank of the Brook, creating eddy currents and slack water that reduced the concentration of flow exiting the Brook out into the river and the cold-water pool located there. 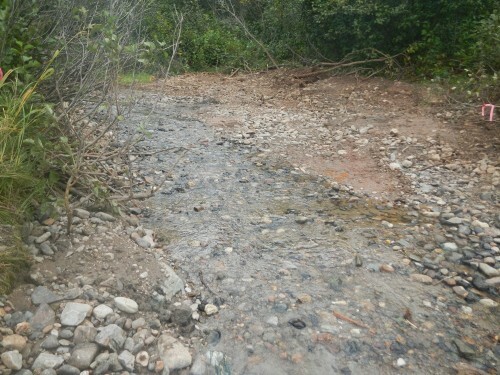 To enhance the Brook’s cold-water flow and contributions, the bankfull width of the mouth of Burnt Land Brook was reduced down to 16 meters from its eroded 27+ metres. This was accomplished by creating a new rock toe location along the right bank of Burnt Land Brook. The constructed rock toe narrowed the channel width and increased the water velocity. This will assist in moving deposition already accumulated on the channel bed and prevent any further deposition from accumulating beyond the local depositional requirements for this reach of the brook to maintain equilibrium. 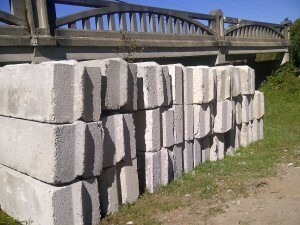 Project cost was approximately $65,000.